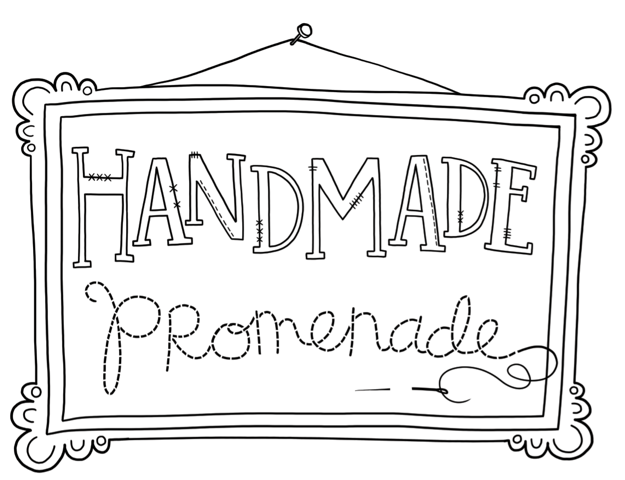 Thanks so much to Cheryl Andrey for designing the new logo for the Handmade Promenade. As always, we love her work and can’t wait to start seeing this splashed all around the town! Exciting things are transpiring on the Handmade Promenade front. We have added several new artists to our July 27th event including Vanessa Monfreda, The String Theories, Fanfare and Foofaraw, Cassandra Foxx Designs and Cordial Kitten! This great list of ladies joins the list of Handmade Promenade veterans EleanorMac, Bebito, Mother Tucker Sews, and Sunday Afternoon Housewife. Yippee! There are still a few vendor spots left. Please email at mellenlatta@gmail.com if you are interested in getting in on the crafty fun! The July 27th event is going to be a great day. Not only will you be able to do all your normal veggie buying at the Stadium Village Farmers’ Market, but you’ll also be able to get some great specialty foods like marshmallows, bloody mary maker, artisan oils and vinegars… and the of course there will many fantastic crafts from all the Handmade Promenade artists! We look forward to seeing you July 27th! More info to come on music, give-aways, and contests, so stay tuned!